Iraqi President Salih and Iran's President Rouhani discuss gas-electricity swap, joint oil exploration, in Tehran talks. 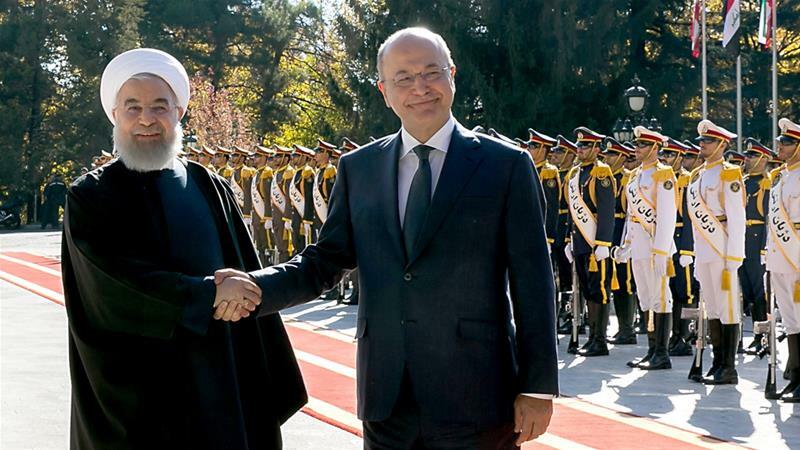 Iraqi President Barham Salih has announced that his country has agreed to establish a "free-trade zone" along its border with Iran, following a meeting with his Iranian counterpart, Hassan Rouhani in Tehran. In a joint press conference in the Iranian capital on Friday, Salih declared that the relationship between the two neighbouring countries is a "fixed principle" that is "rooted in shared history, faith and geography". "We care about our relationship with Iran," Salih declared. Salih did not give full details about the free-trade zone. But Rouhani was quoted on Friday by state television as saying that he wants to raise bilateral trade between the two countries from the current $12bn to $20bn in the coming year. According to reports, the two leaders have also discussed building a 35km railway linking the two countries. Salih's two-day visit in Iran comes less than two weeks after the United States reimposed oil sanctions that had been lifted under the 2015 nuclear deal. Iraq has obtained an exemption from the US to continue buying its energy needs from Iran. The US and Iran are Iraq's two biggest allies and the sanctions put Baghdad in a difficult economic and political position. Iran, which has had a major influence over Iraq since the 2003 US-led invasion that toppled Saddam Hussein, is hoping to maintain exports to its neighbour despite the renewed US sanctions. Iraq is Iran's second-largest market after China, buying everything from food and machinery to electricity and natural gas. Washington has vowed that the renewed sanctions would put financial pressure on Tehran to halt its alleged support for international armed groups, its military activities in the Middle East and its ballistic missile programmes.